SINGAPORE, June 20 – Panasonic’s first Android-based computer tablet designed for tough environments such as battlefields was unveiled yesterday at a major regional telecom fair in Singapore. It was the first time the “Panasonic Toughpad A1” was showcased in Asia, where company officials said there is a huge demand for such a rugged device. It has already previewed in the United States and production will start later this year, company executives said. 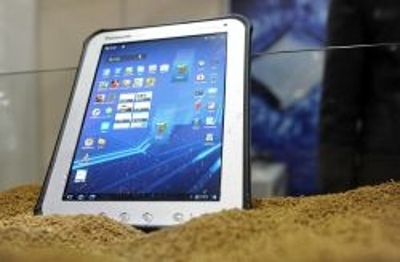 Satoshi Mizobata, a director at Panasonic’s Toughbook Asia Pacific Group, said the device is the firm’s first rugged tablet computer using the Android operating system. Previous Panasonic “toughpads” use Windows. The device weighs 0.97 kilogrammes and its 10.1-inch LCD display allows the user to read even under the sun while it is tough enough to withstand being dropped from a height of four feet (1.21 metres). It also has a nine-hour battery life. Amos Tio, Southeast Asia general manager for Toughbook Asia Pacific Group, said the gadget will launch in the region in September and in the United States in August.